The SAP-Scale Service is the process that handles all communication with SAP and with the device. The ERP-Scale monitor can be used to view what the Service is doing and check for any errors. Select a SAP-Scale Service to monitor from your favourites. Click this to add a new SAP-Scale Service to your favourites by entering the host details. Update the host details for a favourite SAP-Scale Service. Remove a SAP-Scale Service from your favourites. Search for SAP-Scale Services within your network. Requires the Sap-Scale Service to be advertising its status using Zeroconf. See Network settings. The SAP-Scale Service reports messages of various types and severities. The message categories to be displayed can be selected using this option. 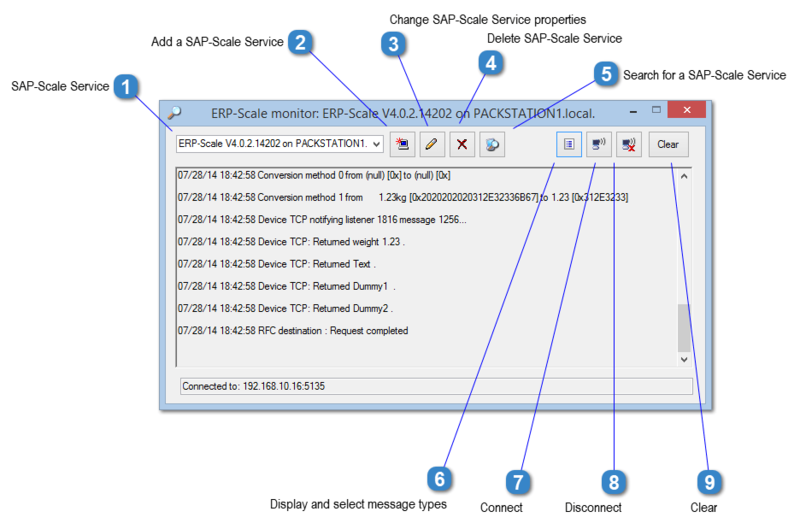 Connect to the SAP-Scale Service and start monitoring messages. Disconnect from the current SAP-Scale Service. Clear the currently displayed messages.